Bout #14: Despite the abysmal second film in the POTA series, I decided to keep going, since it couldn’t possibly get worse, right? And then to get that taste out of my mouth, I decided to watch a mindless Blockbuster when I likely just couldn’t get off the couch. 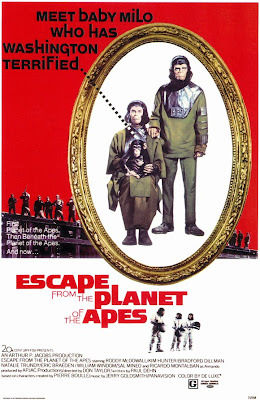 Escape from the Planet of the Apes: Well the good news (and also the statistically unsurprisingly news) is that this movie was better than the last. It stripped down the cast of hundreds of ape heads to just the two main characters who improbably travel back in time to more or less the exact year that Heston left in the original. Why the hell not? My disbelief is already suspended. But it still has that early 70s pacing and effects that apparently weren’t seen as ridiculous back then. 5.5 bugs. Transformers: Maybe I’m a visionary or just stupid, but why not take all the awesome special effects that you have promised the greater public and get somebody to write a real script for it? 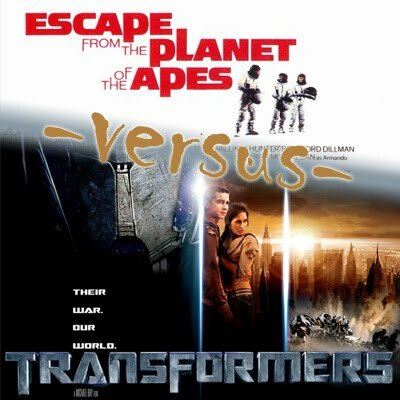 This movie couldn’t figure out if it was Die Hard, Small Soldiers or Evolution. Are you taking yourself seriously or not? But now I know what that whole Megan Fox craze is about. 3 bugs.